A normal appearing x-ray of the scaphoid bone. Image © Jonathan Cluett, M.D. The scaphoid bone is one of eight small bones in the wrist, called carpal bones. These bones allow complex, yet delicate movements of the hand and wrist. The carpal bones fit between the bone of the forearm and hand. The scaphoid sits below the thumb, and is shaped like a kidney bean. Injuries to the wrist can cause a scaphoid fracture, a possible source of hand and wrist pain. Scaphoid fractures are the most common fractures of the carpal bones. The traditional management of a scaphoid fracture, especially for non-displaced fractures, is with cast immobilization. However, healing of scaphoid fractures can take a long time, and sometimes the bone does not completely heal, a condition called a nonunion. Therefore, treatment recommendations for scaphoid fractures may vary and sometimes include surgical treatment. Scaphoid fractures are most commonly caused by a fall onto an outstretched hand. The force of the injury leads to damage to the scaphoid bone. Scaphoid fractures are generally classified as either displaced or nondisplaced. 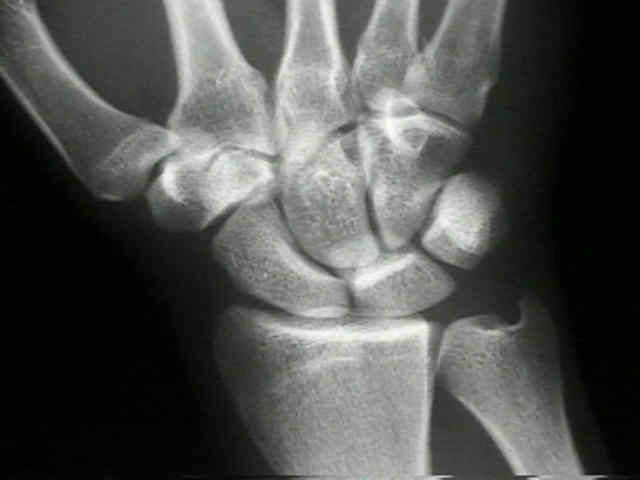 A nondisplaced scaphoid fracture means that the bone has not shifted at all out of position, and the fracture may not even be visible on x-ray image. A displaced fracture of the scaphoid occurs when the bones had shifted out of position. These types of fractures often require more invasive treatment as the healing of a displaced scaphoid fracture is much less predictable. The interesting thing about the scaphoid bone is that is has a retrograde blood supply. This means that the blood flow comes from a small vessel that enters the most distant part of the bone and flows back through the bone to give nutrition to the cells of the bone. This unusual flow of blood in the scaphoid presents a problem when you sustain a scaphoid fracture. Because of the tenuous blood supply, a scaphoid fracture can sever this blood flow and stop the delivery of necessary oxygen and nutrients to the bone cells. When this occurs, healing can be slow, and the scaphoid fracture may not heal at all. Many patients are diagnosed with a wrist sprain, when in actuality they have a broken scaphoid bone. The diagnosis is difficult because x-rays taken right after the injury may show no abnormality if the bone is not out of position. A scaphoid fracture that is not displaced may only show up on x-ray after healing has begun, which can be one to two weeks after the injury. Because of this, it is not uncommon to treat a wrist injury with immobilization (as though it were a scaphoid fracture) for a week or two and then repeat x-rays to see if the bone is broken. An MRI can also be used to diagnose this injury, without having to wait to repeat an x-ray. When a scaphoid fracture heals slowly (delayed union), or does not heal at all (nonunion), the injury may remain painful, and in the long run, arthritis of the wrist will likely occur. The risk of developing a nonunion of the scaphoid depends most importantly on the location of the fracture in the bone. Other factors that can contribute to non-union are smoking, certain medications, and infection. There are two general approaches for treatment of a scaphoid fracture: cast immobilization or surgical stabilization. As long as the scaphoid fracture is not displaced (out of position), cast immobilization is a very reasonable treatment. The cast must extend over your thumb to limit the mobility of your thumb. How high up to extend the cast (above or below elbow) depends on physician preference. Your doctor will continue to monitor the wrist both by examination and x-ray assessment to ensure there is healing of the bone. Healing of a scaphoid fracture often takes 10 to 12 weeks. If the scaphoid fracture is displaced, the risk of nonunion is higher, and your doctor will recommend surgery to reposition the bones, and hold them solidly in proper alignment. The surgery typically involves using a single screw to hold the bone together in the proper position. There is some controversy about using surgery as an initial treatment of a fracture that is not out of position. The advantage is that there is less of a risk of nonunion and the time for immobilization can be dramatically reduced. The disadvantage is that surgery always has risks, and while the complication rate of scaphoid fracture surgery is small, there is a possibility of complications including infection, and injury to cartilage or tendons around the scaphoid. Many athletes or manual laborers choose to have surgery to allow a faster recovery. When nonunion of a fracture develops, surgery is generally recommended to stimulate the bone to heal. A bone graft is often used to promote healing at the fracture site. These injuries can be complex, and require lengthy treatment in order to get the bone to heal. Without proper treatment, wrist arthritis is likely to develop later in life. Scaphoid fractures are common wrist injuries, and the treatment may depend on a number of factors. Cast immobilization avoids surgical treatment and risks of infection and cartilage injury, but may require prolonged immobilization and lead to stiffness of the joint. Surgical treatment has risks associated, but may provide more predictable healing. There are factors such as patient age, activity level, fracture location and type that may all influence the recommended treatment. Moon ES, Dy CJ, Derman P, Vance MC, Carlson MG "Management of nonunion following surgical management of scaphoid fractures: current concepts" J Am Acad Orthop Surg. 2013 Sep;21(9):548-57. When Is Surgery Necessary for a Broken Collarbone?